David Cameron has been reading Francis Fukuyama, I think. True, he has distanced himself from liberal interventionism. True, he has a few prominent “realpolitik” specialists around him. True, he has more than once expressed scepticism about the ability of states to create “utopias”. But he has balanced these with a willingness to support human rights and democracy – or at least express more interest than many of his predecessors. Eighteen months ago he met a Burmese dissident. This year he met some North Korean defectors. His Shadow Foreign Secretary William Hague has said he will put human rights “at the heart of foreign policy”. It is this balance that makes me think he has been reading Fukuyama – if I have interpreted the signs correctly, I would summarise it as an idealistic commitment to the values of freedom and human dignity rooted in the realistic recognition that we need to pro-actively support those struggle to achieve them overseas, rather than re-actively invade to impose them. And I think this gets us back to the root of neo-conservatism. On 11th September last year, the fifth anniversary of the 9/11 terrorist attacks in the US, David Cameron described himself as a “liberal conservative” not a neo-conservative. I agree with him and would describe myself in the same way. But the difference between these two phrases is less about substance and more about connotations. “Neo-con” is a phrase badly contaminated by the failures of the Bush administration and the disaster of post-war Iraq. Francis Fukuyama provides the original definition in his book After the Neocons: America at the Crossroads. According to his definition, I think it is time for me to come out as a neo-con – though I’d prefer the label “liberal conservative”. “A belief that the internal character of regimes matters and that foreign policy must reflect the deepest values of liberal democratic societies”. “A belief that American power has been and could be used for moral purposes, and that the United States needs to remain engaged in international affairs”. “A distrust of ambitious social engineering projects”. “Scepticism about the legitimacy and effectiveness of international law and institutions to achieve either security and justice”. Concerning the second, I believe profoundly that the US can and must be a force for good in the world. It has not always acted consistently, its actions have not always matched its words and its follow-through has not been unproblematic, but in my experience as a human rights activist the US has been the best champion of human rights and freedom in the world today. When I turn to the British Foreign Office or the European Commission for help in response to dire human rights issues in Burma or Pakistan, for example, the response is frequently pathetic. When I talk to my friends in Washington – in the White House, the State Department and the Congress – I almost always find they are ready to respond quickly – and sometimes they are already several steps ahead of me. The US made terrible errors in not planning for the post-war situation in Iraq. The US was complicit with Indonesia’s invasion of East Timor, and President Ford and Henry Kissinger were in Jakarta the day before the invasion. The weapons used in Vietnam against civilians were shocking. And Abu Ghraib and Guantanamo are an outrage. But while these aberrations may undermine, they should not detract completely from the fact that the US has been, and I hope will continue to be, a force for moral good in international affairs. The third point is also very valid – and Cameron’s speech echoes Fukuyama. “I recognise the complexities of human nature, and am sceptical of grand schemes to remake the world,” said Cameron. “The ambition to spread democracy is noble and just. But it cannot be quickly achieved to suit a political timetable. Because it takes time, it cannot easily be imposed from outside. Liberty grows from the ground - it cannot be dropped from the air.” I entirely agree – and our role is to strongly support movements for democracy and human rights in countries ruled by dictators, not seek to “impose” it ourselves. Finally, scepticism about international law and the institutions which are meant to implement it, primarily the UN. I do not share some neo-cons’ hatred of the International Criminal Court and the International Court of Justice. Indeed, I warmly welcome them and believe we should make more use of international law to prosecute those guilty of crimes against humanity and genocide. But I do share the neo-cons’ belief that the UN has badly failed to live up to the values enshrined in its Charter. It is the only club in the world that you can join, sign up to the rules, and then daily flout those rules with little penalty. That does not mean we should not seek to work in a multi-lateral way where possible. Clearly, building a united coalition of countries is more desirable than being a lone ranger. But where it is not possible to get action through the UN, other bodies – such as the Community of Democracies and NATO – should be developed as an alternative. And, in the most extreme instances, we should be prepared to act alone in the interests of freedom and human dignity. He does not, however, disagree with regime change. “Certain political problems can be solved only through regime change ... Regimes that treat their own citizens unjustly are likely to do the same to foreigners. Thus efforts to change the behaviour of tyrannical or totalitarian regimes through external rewards or punishments will always be less effective than changing the underlying nature of the regime,” he writes. “One of the consequences of a perceived failure in Iraq will be the discrediting of the entire neoconservative agenda and a restoration of the authority of foreign policy realists,” Fukuyama writes. He articulates clearly his distaste for “realists” – the Henry Kissingers and Sir Percy Craddocks of this world. “Realism can at times become relativistic and agnostic about regimes; realists by and large do not believe that liberal democracy is a potentially universal form of government or that the human values underlying it are necessarily superior to those underlying non-democratic societies. Indeed, they tend to warn against crusading democratic idealism, which in their view can be dangerously destabilizing,” he writes. This is one area where alarm bells are ringing. There is a danger in listening too much to the ancient mandarins. As much as David Cameron may wish to distance himself from neo-cons, I hope he does not get too close to the “realists”. I hope he reads Nick Cohen’s What’s Left? on this subject. Fukuyama quotes William Kristol and Robert Kagan’s 1996 article in Foreign Affairs, in which they argue for a foreign policy that entails “resisting, and where possible undermining, rising dictators and hostile ideologies; … supporting American interests and liberal democratic principles; and … providing assistance to those struggling against the more extreme manifestations of human evil.” Fukuyama concurs with this, but argues that wherever possible, this should be done with “soft power” rather than force. He advocates initiatives such as the National Endowment for Democracy, the International Republican Institute, and George Soros’ Open Society Institute. Our own Westminster Foundation for Democracy, set up by John Major’s Government, also does excellent work – but needs to do more. In democracy promotion, Fukuyama argues, “the initiative has to come from within the society in question … Outside funds and organizers are critical in helping to strengthen these organizations, but the latter must sink their own roots in their own societies.” I agree entirely. But where there are competent, able groups struggling for freedom, we should support them. The House of Commons International Development Committee this week recommended that the Department for International Development (DFID) fund Burmese exiled human rights and pro-democracy groups engaged in crucial documentation, reporting and education work. This is exactly what Fukuyama is talking about – and DFID should listen. Call it what you will – Wilsonianism, Henry Jacksonism, liberal conservatism, neo-conservatism. For me, as William Hague has said, putting human rights at the heart of foreign policy should be a priority for Conservatives. If we have a pro-active foreign policy, as James Mawdsley and I have argued in New Ground, force becomes what it always should be – a last resort. As Fukuyama says, we need to concern ourselves “with what goes on inside other countries, not just their external behaviour, as realists would have it.” Let’s put the realists to rest, and become realistic idealists. Benedict Rogers is a human rights activist and Deputy Chairman of the Conservative Party Human Rights Commission. Ben has lived in Washington, DC, Hong Kong and East Timor and travels regularly to Burma, Pakistan and other countries to document human rights violations. He was the Conservative Party Parliamentary Candidate in the City of Durham in 2005. - This was how I had understood Cameron until a couple of weeks back. It is now clear that Ben and I are/were wrong. What is meant by liberal conservatism can be seen in Mitchell's recent TRG pamphlet (which, since he is a frontbencher, presumably had Cameron's blessing). Liberal conservatism means a high willingness to bless or participate in UN action, but extreme reluctance to act outside that framework. - The problem with world government, and its putative institutions such as the international criminal court and the UN (understood in that way) is not just that he UN is ineffective. It is that the whole concept of world government and international law (understood in that sense) is wrong. - No-one thinks that war is the first option. The biggest - and most serious - policy failure on any issue by the Conservatives since 1997 was IDS's unquestioning support for the Iraq war. It is unbelievable that HM opposition deliberately did not ask a single question at the statement marking the publication of the September dossier. it was the poisonous legacy with which both of his successors have wrestled. I have no doubt that if we could have credibly reversed our position on Iraq that we would be in power now. It was clearly the biggest issue at the last General election and yet we ducked it. What Cameron is now doing is very skilful. He still feels he will be labelled an opportunist if he resiles from his position of support for the war but he knows that the only credible position is to learn ffrom that nightmare. So he is distancing the party by stealth. 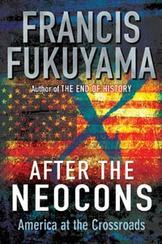 Francis Fukuyama has been proved to be a rotten forecaster ("End Of History") and an unprincipled opportunist (joining the neo-con bandwagon and then jumping off when the Iraq war got tough). The problem with the neo-cons was that they never learned the lessons of Vietnam. Trying to impose Western democracy by force does not work. A substantial proportion of the local population always rise up against the imperialist forces. A long occupation is inevitable. Britain soldiers will be fighting the Taliban, and dying in significant numbers, for years to come. The great irony is that the US government armed the Taliban during the Soviet occupation of Afghanistan. It funded and armed Saddam Hussein (Rumsfeld was Defence Secretary) when Iraq was at war with Iran. We are paying the price for that liberal interventionism now. Of course, when it comes to human rights, the neo-cons and their allies fail to address the rights of a key group - our taxpayers who are forced to pay these foreign misadventures. Then there are the soldiers who enlisted to defend our country. They they did not sign up to enforce the imperialist ideology of the Kristols, Podhoretzes, Perle and Frum. That cabal if full of ex-leftists (Kristol was a Trot) who swapped sides when the Democrats were on the ropes. Henry Jackson was a Democratic senator, fact that the Jacksonites in this country prefer not to talk about. There is one Republican Presidential candidate who can take American conservatism back to its small government, non-interventionist roots. Ron Paul (ronpaul2008.com) raised $4.5 million online in 24 hours yesterday - record. The mainstream media, probably under pressure from the White House, have ignored the Ron Paul Revolution. They cannot any longer. It is time to spread the message of the Ron Paul Revolution here. We must remove the neo-con poison from the Conservative Party. [email protected]:54 is mistaken. IDS and a number of other Conservatives at the time did very much criticize the case Blair put forward for the war. But that was not because they did not support going to war. We criticized only the case, not the decision. And indeed the decision (based on the information that we had at the time) was correct - no front-bench Conservative has resiled from that, as far as I know. "David Cameron has been reading Francis Fukuyama, I think"
Andrew Lilico is completely wrong. No argument was made against the case for war until after the death of David kelly. A decision was taken at the time by the opposition to stick as close to the Blair government as possible. Bizarrely it was believed the Iraq war would increase Blair's popularity. Lilico is also wrong about what front benchers have said. Dominic Grieve has since said he could not have voted for the war if he knew then what he knew now - as has Lansley and alan Duncan. IDS was gullible. He believed the nonsense that he was told by the neo-cons in the American Enterprise Institute and was rewarded with a metting with Dubya. Liam Fox, a neo-con hawk, must also take his share of the blame. If you think that Iraq is bad, just wait until President Guiliani attacks Iran (as his foreign policy adviser Norman Podhoretz advocates). We must hope that he does not get the chance and that Bush does not beat him to it. It is dangerous to bring ideology into foreign policy. Each foreign policy situation is different and requires a different response at any given time and is of itself conditioned by the ability to respond. It was naive of the neo-cons to think they could apply ideology to foreign policy no matter how admirable their underlying objective of bringing democracy to rogue despotic states. We all know that neo-con consistency would have fallen flat if say China had invaded Taiwan or if in the future a Zhirinovsky led Russia took to invading Turkey. Foreign policy cannot be built on exercizing hegemony over small states that cannot fight back. Such policy creates resentment and re-enforces the perception of America and the UK as being hypocrites. Grow a pair, as they say in America. You - the Euston Manifesto Group (old Stalinists and Trotskyists), the Henry Jackson Society (old stooges of apartheid South Africa and Pinochet's Chile), and so forth - stand for something distinctive, which you at least pretend to believe is able to bring together the best in each of Britain's three political traditions. Indeed, you at least pretend to believe that that cannot be said of the position of us economically social-democratic, morally and socially conservative British and Commonwealth patriots, as we believe that it cannot be said of your position, either. But we are prepared to put ourselves to the test honestly at the ballot box, i.e., in the form of a party. See my blog for the details. Are you? If so, then where is your party? And if not, why not? Frit? I think so. So go on, then: prove me wrong. Grow a pair. Set up a party. All else from you is wind, to be blown back at you. And it will be. If you neocons don't want people to vote for us (and why would you want that? ), then what alternative are you offering? Two, soon to be three, parties that you have stolen, but none of which, even then, really suits you? Or a party of your own? If the latter, then where is it? You tend to try and sell yourselves (absurdly and dishonestly, but there we are) as the voice of popular wisdom against elite folly. Well, doesn't that popular wisdom deserve an unambiguous voice at the ballot box? Where is that voice, so that no voter ever again faces the prospect of choosing between an Old Labourite, a High Tory and a Lib Dem? In opinion polls, the determined non-voters are now never lower than 34%, and sometimes as high as 38%, but are factored out for headline purposes. We are trying to reach that huge potential electorate. Are you, the diehard neocons of the same persuasion as Oliver "Vote Tory To Unseat An Anti-War Labour MP" Kamm (who'll never be a Labour MP or a Labour peer after that) and Douglas "Vote Labour Because The Tories' Vice-Chairman Wasn't As Unyieldingly Pro-War As I Was On Question Time" Murray (who'll never be a Tory MP after that), also trying to reach those disenfranchised? If so, then where is your party? you are dancing on the head of a pin and are still wrong I'm afraid. The "if I knew then" argument is importnat because the case was based on WMD. Ie what lansley, Grieve, Duncan and many other frontbanchers say in public and private is that they believed the government's case on WMD and therefore supported the war. They now know that case is bankrupt. They certainly know that regime change as a case for invasion is ilegal and so wouldn't back that either. And wouldn't have done so at the time! IDS did not make that argument at the time. he could not as Leader of the Opposition. He made the decision to offer slavish unquestioning support. Indeed at the time of the vote the Whips performed a very effective job silencing any form of opposition. I'm sorry but you are wrong on this. I think you are applying hindsight and later arguments and become mistaken. Why is there no coverage of anti-war Ron Paul's massive $4 million raised online by grassroots supporters on Monday? This Guy Fawkes Day "money bomb" has astounded the mainstream media in the States. It was not even an official campaign. Yet this site, its sister "Britain and America" and the British media are ignoring it. Are they taking orders from the neo-cons or the Government? I bet that the Editor has had his instructions from David Frum and his chums at National Review. First option to what, it depends on the circumstances - the options available depend on the particular situation. The Iranian authorities are relatively benign, unlike Al Qaeda or the Ba'athist Party they are genuinely trying to improve Iran, certainly they are seriously flawed but they have neither the dogmatic negativity of Al Qaeda that almost seems to feel guilty about the concept of improving things for people, or the corrupt power crazed squandering of resources out of sheer vanity and sleaze that came to characterize Ba'athism especially the Iraqi Ba'ath Party. In Zimbabwe as in Iraq there is the squandering of resources, what should be a rich country made poor - environmental destruction, persecution of minority groups and creation of a narrow favoured elite. Robert Mugabe has declared not only that he wants to continue as President, but far worse that he wants to pick his successor, therefore options of assassination, fostering a military coup or even outright regime change are all valid options. If China were to attack Taiwan then it would be valid to meet that military force with military force by the US\UK and maybe other NATO allies. In Chechnya or Tibet because of the long establishment of military powers there coupled with the ramafications, maybe it would not be appropriate. If Spain were to send forces into Gibraltar then a military response from the UK as a first course of action would be appropriate. Treaty arrangements can make military action the first option from a moral standpoint such as when Germany invaded Poland in 1939. If Indonesia invaded Australia it would be appropriate to send forces to help Australia. In the Balkans it was appropriate to take action against Serbia and the Bosnian Serbs, generally the tendency has been in the 20th century to be far to slow to move to military action and so been perceived as being weak.